Forest Town Guest Cottages - Forest Town Accommodation. 6/20 - 2-bedroom family villa with large serving counter between kitchen and lounge. 14/20 - Modern en suite bathroom in deluxe East and North facing villa. 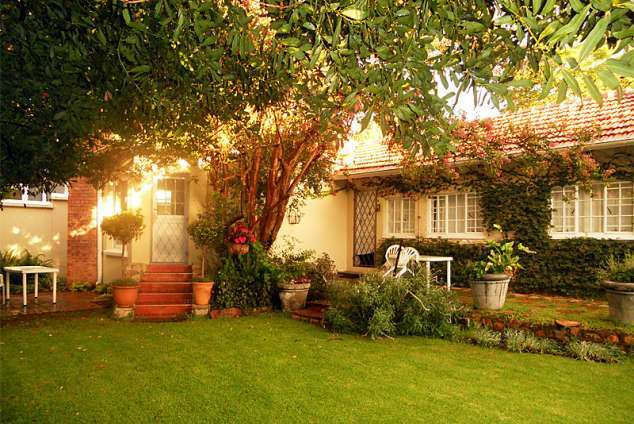 Situated in the secure and leafy suburb of Forest Town in Johannesburg. SELF-CATERING accommodation; ideal for comfortable quick stopovers or longer stays. These attractively and comfortably furnished villas are self-contained, separate and private, 1- and 2-bedroom villas to suit families, the business traveller and tourists. Set in an expansive mature garden, it is located in the densely treed suburb of Forest Town, close to the business hubs of Johannesburg with easy access to main transport routes, convenient shopping, golf courses, excellent restaurants, and major hospitals in Parktown and Rosebank. The facilities comprise 1- or 2-bedroom villas each with a modern en suite with large frameless shower or full bathroom with both bath and shower, a comfortable lounge and a well equipped kitchen that makes for easy self-catering. The 2-bedroom villas sleep a maximum of 5 guests. There is secure parking behind automated gates. Other features include DSTV, Wifi, and complimentary laundry service for guests staying more than 7 nights. Popular supermarkets, fruit & veg grocers and sidewalk restaurants are within 3km. The suburb security is excellently managed by the Forest Town Secure Village Initiative with roving 24/7 security and CCTV cameras on street corners. Also, to secure a reservation full payment is required in advance to ensure the safety of all guests and avoid double bookings. Each villa has excellent security. Forest Town Guest Cottages is perfectly located with the convenience of close proximity to the business hubs and local facilities. 14959 page views since 28 Nov, 2008.